The poem does not do it justice in any way, but I enjoyed playing! knew I’d asked too much. I take them in my stride! would not recognise this sea, the way it is tonight . my stone heart just can’t care. aren’t much better. Look at my face – that was you. Your smell I want, the bitter whiff of brine. of us who can – who will return to sea! This entry was posted in birds, natural world, One Stop Poetry, poet, poetry, Uncategorized, writer, writing and tagged birds, natural world, one stop poetry, poet, poetry. writer, sea. Bookmark the permalink. Flying with WordPress takes on a whole new meaning! Thoroughly enjoyed the poem. thank you – glad you enjoyed it. Fun, good read. Thanks for the laughter. glad you liked it – thanks for reading it. thank you for commenting – I enjoyed scribbling it and am glad you liked it. 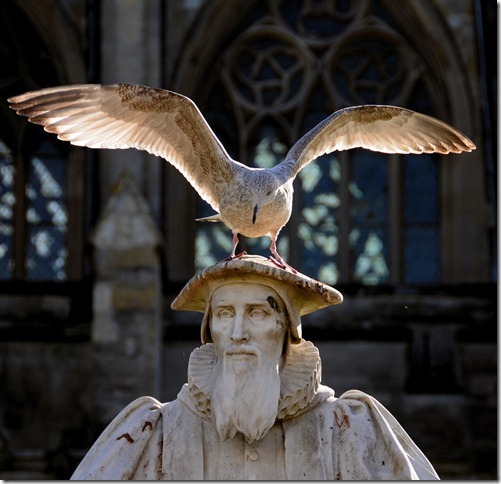 I love the way you’ve created a dialogue here between gull and statue. I adore the third stanza. Great write. Thanks for sharing, James. thank you James, it is a great photo and I didn’t really do it justice, but loved having a go. Thank you for letting us use it as a prompt. Lucky bird! Thank you for reading it and glad it raised a smile. it certainly has a comic element – what a great photo. Thanks for reading and commenting. i love it! really enjoyed the conversation. thank you – it was fun writing this. glad you liked it. thank you Dani – and all the thanks the guy gets for talking to the bird is poo on his face! Thank you for reading and commenting.